C. Yamahata, Ph.D. (2005) and M.Sc. (2000) in Microengineering, graduated from the EPFL (Lausanne, Switzerland). My R&D activities are mainly focused on the development of Micro Electro Mechanical Systems (MEMS) dedicated to scientific instrumentation. 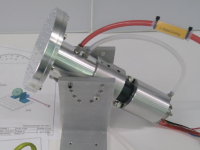 Photograph of a motorized rotary union designed for high vacuum. 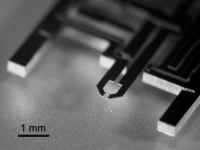 Photograph of Silicon Microtweezers fabricated by Silicon-On-Insulator (SOI) technology. Click on a keyword to see the related projects.